I remember the first time I encountered a deer . . . . I though it was a Great Dane. I know. . . . it sounds ridiculous . . . .
. . . .but it’s true. I may be a little near-sighted. . . . but after living in the country for fifteen years and never encountering a deer. . . .
. . . .I didn’t expect to see one in my path while I was jogging . . . . in the middle of the day. When I realized what it actually was I thought Wow! That is so incredible . . . . a deer! Now we live in town . . . . and when I see a deer I think On no! I hope those eating machines bypass our yard and hit the neighbors’ instead! I know . . . .that’s not very nice . . . . to wish the deer on my neighbors . . . . but it’s a dog eat dog world . . . .
. . . . and I would like to keep a little of our landscaping intact. When we lived in the country we didn’t have any problems at all. Now . . . . in town . . . . we can’t control the varmints. We have moles . . . . we have voles . . . . we have rabbits . . . . we have slugs . . . . we have chipmunks . . . . we have squirrels . . . . and last but not least are the herds of deer. Yes . . . I said herds. Since we’ve lived here we’ve spent a fortune on prevention. There are the pills that you bury close to the plant roots. There is the powder you sprinkle around the plants for the slugs. 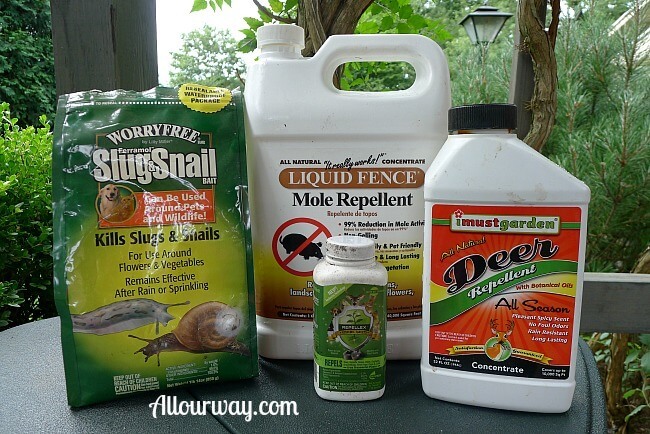 There is the greasy, slimy stuff you put in a watering can and sprinkle throughout the flower beds. And there is the spray that you put in a sprayer to mist all of the plants. What is not pictured are two different kinds of traps . . . . I didn’t think it would look too good in a picture. And after all this . . . . we still have all of the above mentioned varmints . . . . especially the deer. The powder may work for a little while but then the slugs are back . . . . hungry as ever. We’ve heard that beer in a dish will work . . . . I guess they get thirsty and drown in the beer. No thanks! I don’t want to be buying beer for the slugs and then have to empty the container. The way My Monet is supposed to look is on the left and on the right is how My Monet looks now. 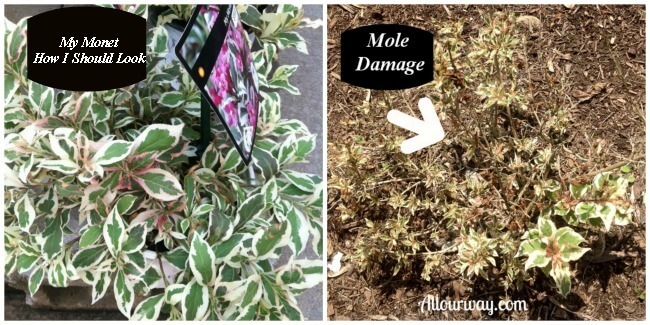 We have tried trapping the sneaky mole and even sprinkling the sticky, greasy stuff in the garden beds . . . .
. . . . but the determined mole (s) keeps burrowing under the small bush resulting in damage to the bush’s roots. Voles are just as bad . . . . only they eat the roots and the bark of plants and part of the problem is mulch. Mulch is a haven for moles and voles.
. . . .worst of all are the deer. I have babied this plant for over twenty five years. . . . I dug it up and brought it with me when we downsized. It is unusual because it has a curled edge around every leaf . . . .it is a beautiful plant if the deer would let it get some leaves. I’ve buried the pills around the roots and sprayed the leaves . . . . you can see how well it has worked. 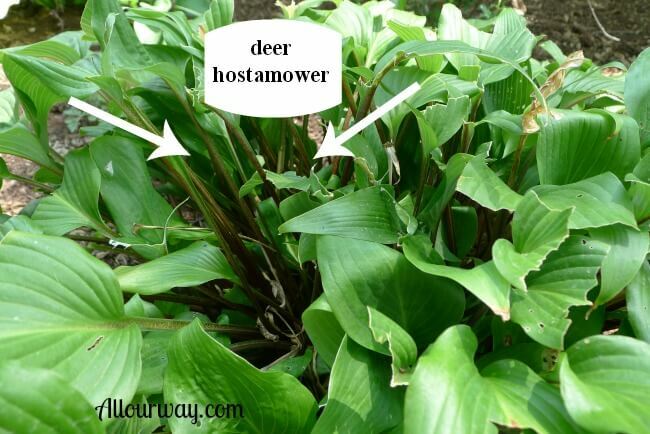 I’ve had this hosta for several years and this is the first time that the deer have done this much damage. 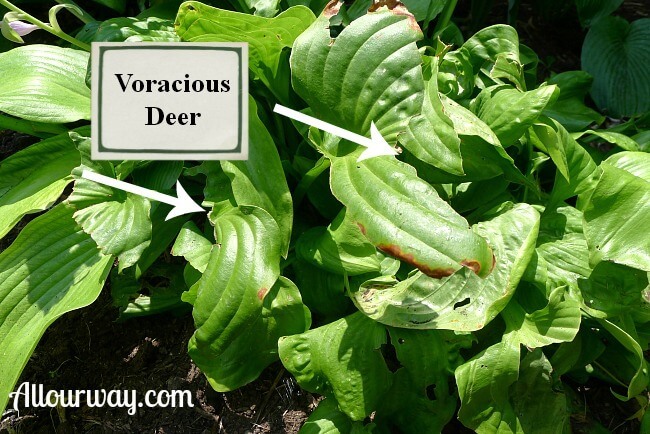 . . .
. . . .which is evidence that there are more deer eating all plants that are available. This Aborvitae is part of a tree row bordering our back yard. It did make a nice privacy fence until the deer took it upon themselves to try to make the tree into a topiary. . . . from the looks of it . 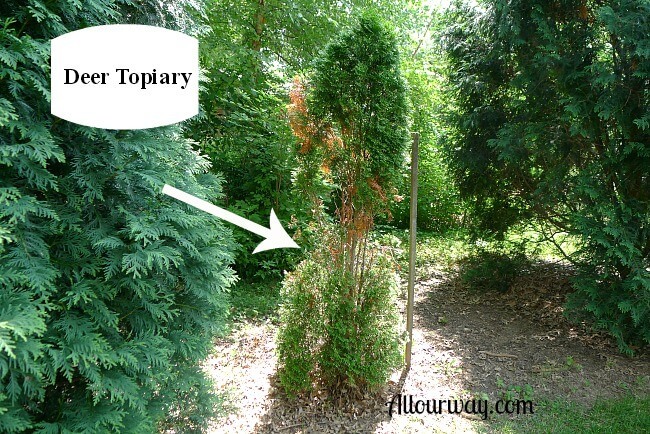 . . .
. . . .the Arborvitae may not make it. Well things are not hopeless! I believe that I may have a recipe for deer prevention . . . .
. . . . it is too soon to tell if it is a 100% success . . . . but it is quick . . . . easy . . . . and cheap. I read about this solution in my Fine Gardening magazine the August 2014 issue on page 12. You can still get the issue if you’re interested. The recipe for the repellent came in as a reader’s tip. All it takes is eggs and water. I know . . . . it sounds too simple! I’ve made the solution twice and so far it seems to be working. The ratio is 12 eggs to 5 gallons ( 20 quarts) of water. You can make a smaller batch just as long as you keep the proportions the same . . . .
. . . . 3 eggs to 5 quarts of water. One thing I did learn that was not in the tip — strain the solution before you put it in a garden sprayer or spray bottle. If you don’t the sprayer could get clogged. Another plus to this deer repellent is that you don’t have to apply it after every rain . . . . but as cheap as it is . . . . if we have a lot of rain I reapply. Great ideas! It looks like your solutions is doing well! Thank you — I read about the solution in my Fine Gardening Magazine — so far the plants are thriving. No garlic? How do you strain your egg/water solution before putting it into the spray bottle? How long will this solution keep? Live in a gated, Sr. Citizens community and the deer are very plentiful here..they are beautiful animals but they cause a lot of destruction with trees and shrubbery and the landscaping contractor chooses the plants they put in very carefully to make sure the deer don’t like them. There isn’t any need for garlic on this recipe. The solution will keep quite a while — if there is a lot of rain I will reapply. If there isn’t a lot of rain– just a few sprinkles — it stays on. It is so easy and cheap to make I cover my bases and reapply have heavy rains. The way I make it is:I use an electric mixer to mix the eggs and part of the amount of water I’m using. It will get pretty frothy! Then I take that amount and pour it through a tea strainer — something that has small mesh so that it can capture the white bits of egg white that don’t dissolve. I learned this lesson the hard way – in the original article they didn’t say anything about this and my sprayer kept clogging up. Once I started putting the liquid through the tea strainer I didn’t have any problems at all. 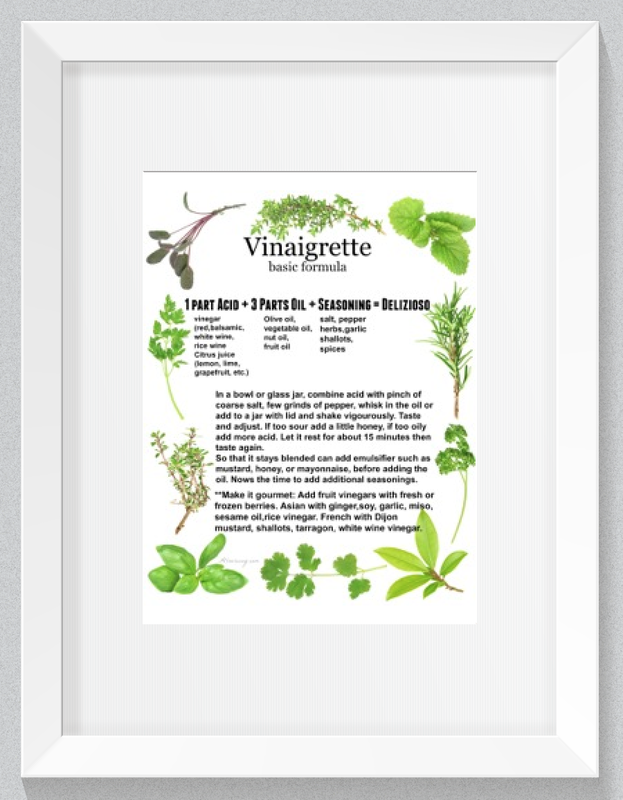 There is no odor and it won’t hurt other plants or vegetables. I hope this helps. If you have any other questions please feel free to ask — I’ll be more than willing to answer. I will be posting updates as time goes on to see how successful this is. It has been working for four months now. Would enjoy hearing about any and all tried & true solutions to ridding a yard of moles/voles. Have tried a trap but have not been able to get him or them yet. So far the deer solution is working. If we get a lot of rain I reapply the solution. The only thing we’ve had success with is trapping (killing) the moles. AND the only trap that we found works is the kind that has two pinchers at the end. It lies flat on the ground with the pinchers following the burrow. If you want information I can find the link to Amazon — this is kinda funny but my son was having problems and I had Amazon send him a trap like ours. Within two days he that that varmint!! The deer solution should be put through a tea strainer so the little bits of egg white don’t clog up your sprayer. Hope this helps. If you need more advice just let me know. The mole trap we use is like the one I wrote about above — Wire Tek 1001 Easy Set Mole Eliminator Trap. It takes a bit of patience but it does pay off. Look for a fresh run and then press the trap down and wait. If the mole doesn’t use that one keep an eye out for the fresh run. This summer alone we’ve eliminated 8 — our yard is less than an acre. We bought ours at a co-op and we ordered one for our son from Amazon. It is called Wire Tek Easy Step Mole Trap Eliminator. We’ve tried many traps before and if you follow the directions it is easy to use and it is effective. This summer alone we’ve eliminated 8 of those destructive varmints. If you have any problems locating one or unsure of how to use it — just write and I’ll see if I can help. So far so good — the deer seem to be keeping away from the roses and the poor hosta. I’ll keep everyone posted — this is a major issue here. If I find a solution for the moles I’ll post that too. Marissa: your deer have certainly done some damage! We had deer problems when we lived in Illinois, but the deer ate ALL the leaves. 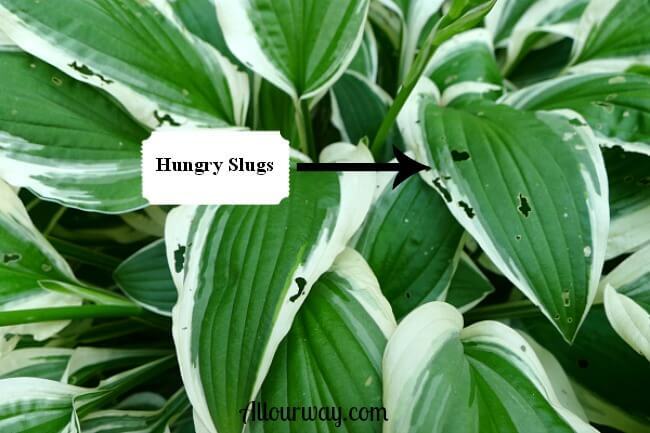 What was left was 10 or 12 little stubbs poking our of the ground—-they actually looked similar to the hosta as it emerges through the ground in the spring. Thank heavens we don’t have to fight the deer here in NW Indiana. We do have chipmunk and squirrel problems here—the chipmunks being the worst of the two. I don’t like killing animals, so I bought what’s called a “tender heart” trap. You bait the trap with food, and when the chipmunk goes inside, a door closes. Then we pick up the trap and take it for a ride a mile away where we let the little varmit loose. We thought we only had 4 or 5 chipmunks. The first year we used it, we caught 42!!!! The second year, we caught 20. This is the third year we’ve used it, and so far we’ve caught only 9 chipmunks, 2 squirrels, and 1 rabbit. Those little chipmunks ate our strawberries, took chunks out of our tomatoes, and took several chunks out of our eggplant!! The nerve of them! Best of luck with your battle—I sympathize—I know exactly what you’re going through!! !